DRS will be participating in the 34th Annual Foodshare Walk Against Hunger - Disaster Restoration Services, LLC. We love nothing more than participating and helping a good charity, which is why we have chosen to form a team and raise funds and awareness for Hunger in Connecticut. DRS has raised $455 dollars as of today, and is ranked #6 in the top teams. Hunger in our own community is a serious problem, and I am choosing to be a part of the solution. I hope you will support my efforts, or join me by becoming a walker! 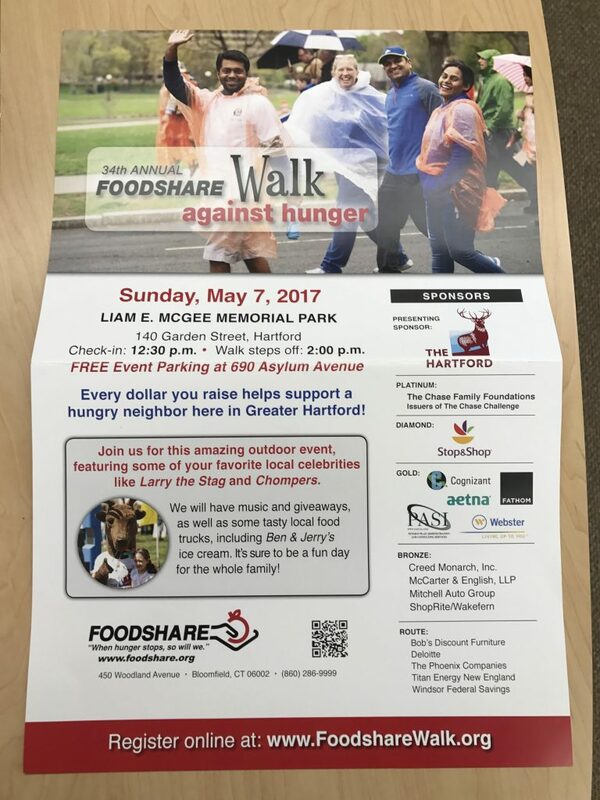 The 34th Annual Foodshare Walk Against Hunger is Sunday, May 7, and I am walking to raise awareness and money to make a difference for those who are struggling to put food on their table right now. They need my help – and I need your help – today.More than 137,000 people in Hartford & Tolland Counties are food-insecure. Fortunately, there are people like you who care enough to help. Thanks to large-scale donations from the food industry, Foodshare provides 11.5 million meals annually through service partners across the region. Your gift supports that important work. But it doesn’t end there. Your donation also allows Foodshare to collaborate with community partners across the state–advocating for legislation and policy to benefit those in need—ensuring a more stable future for everyone who lives in Connecticut. Your gift of any amount makes a tremendous difference and your generosity goes far – every dollar provides immediate relief for a hungry neighbor! Donate through my personal fundraising page online at http://site.foodshare.org/site/TR/Walk/General?team_id=14467&pg=team&fr_id=1341 or send a check payable to Foodshare (don’t forget to include DRS-Disaster Restoration Services in the memo line).